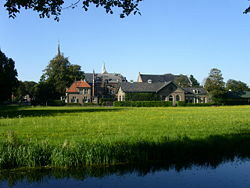 Overveen is a town in North Holland in the Netherlands, in the municipality of Bloemendaal. Overveen lies on the eastern fringe of the North Sea dunes. To the east it borders the built-up areas of Haarlem. A few kilometres to the west of the town lies the Erebegraafplaats Bloemendaal (Honorary Cemetery), where many Second World War victims have been reburied, including resistance fighter Hannie Schaft, sculptor and resistance leader Gerrit van der Veen, banker and resistance member Walraven van Hall and sculptor and resistance member Johan Limpers. The town is connected to rail service by the Overveen railway station. Lonbar Petrilaan 28, in the Kweekduin neighborhood, was built in 1956-57 by noted Dutch architect Gerard Holt. Its garden, designed by Mien Ruys, was the first bielzentuin in the Netherlands. The house is on the list of municipal monuments. ^ "Straat: Lonbar Petrilaan" (PDF). Gemeentelijke Monumentenlijst. Bloemendaal. Archived from the original (PDF) on 9 June 2011. Retrieved 18 May 2010. Wikimedia Commons has media related to Overveen.